Who doesn’t love a flamingo? Lanky, pink birds, what’s not to love eh?! These beautiful creatures were the number one reason for us heading over to Celestun on Yucatan’s gulf coast but they were not the only awesome part of our trip to this sleepy fishing village. Before arriving in Celestun from Merida we had a look around at accommodation options & found them to be very limited indeed. As we were arriving on a Friday & Mexicans tend to travel to the beaches a lot during the weekend we really did think it was best to get something booked just to be on the safe side. After checking out trusty Airbnb we found Arturo’s Place which for Celestun was a pretty good find! The rooms were very basic but the location was fantastic! We were literally right on the beach & waking up every morning to the sound of the ocean, walking straight out onto the sand was just amazing 🙂 We would highly recommend Arturo’s place if you are looking for an Airbnb in Celestun! New to Airbnb? Follow this link to get up to $62 off you first trip! 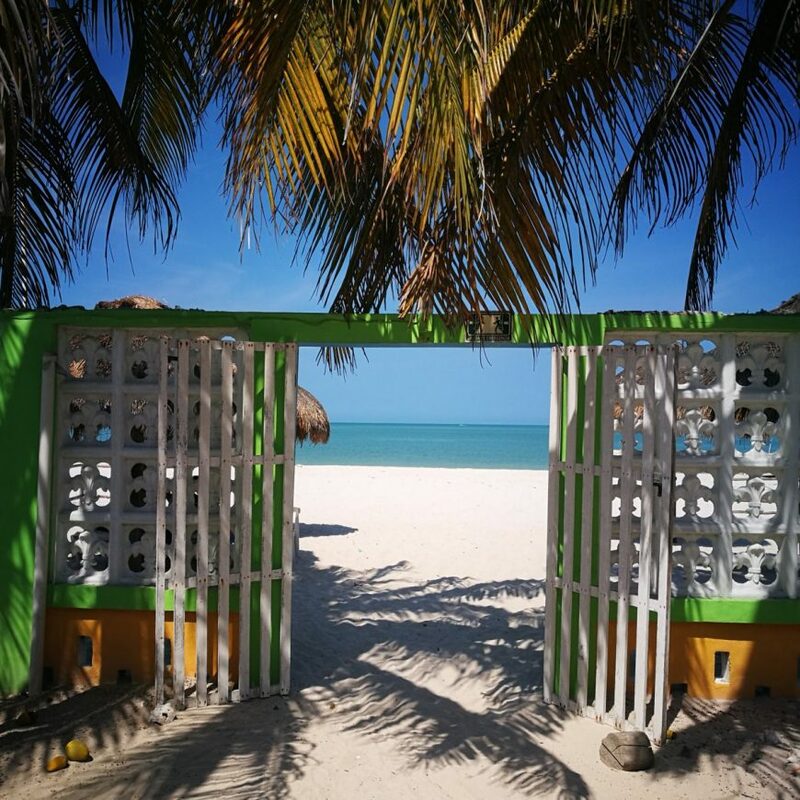 You can also check out the other great places to stay in Celestun on booking.com here…. We had read reviews about where to take a tour from & which tour to take. 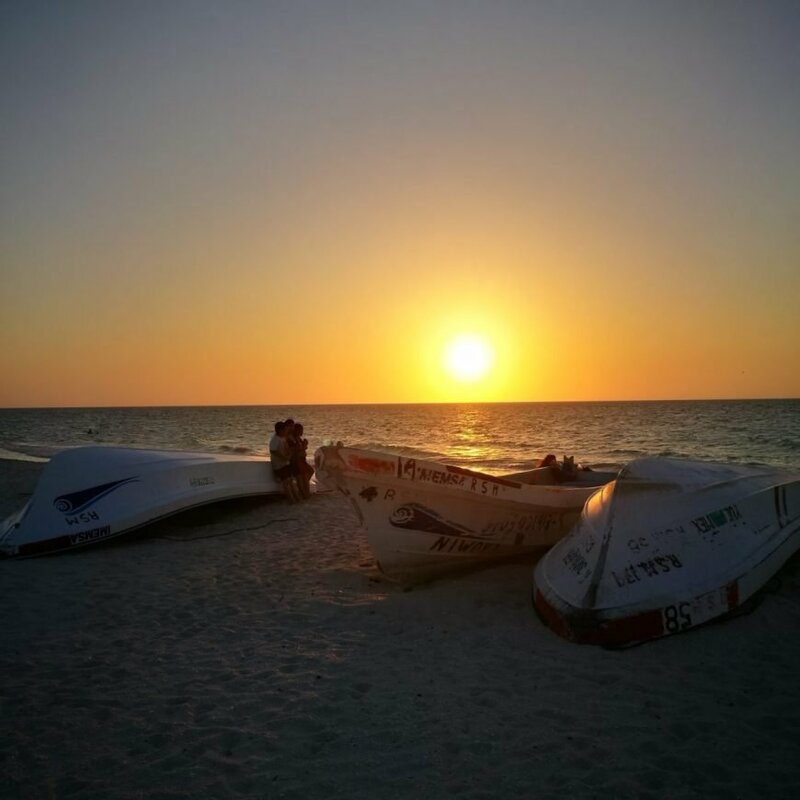 There are 2 main options in Celestun, the beach or the port, the latter being the slightly cheaper option. We ended up deciding on just hopping out of bed & taking an early morning tour right from the beach where we found 3 other people to join us & paid 300 pesos per person. Off we sped away from the beach with our driver & guide Juan & were shortly in a sea of pink, there were literally thousands of flamingos all around us, it was a magnificent sight. We spent a little while just watching them in their natural habitat whilst our guide explained a bit about the wildlife in the area. 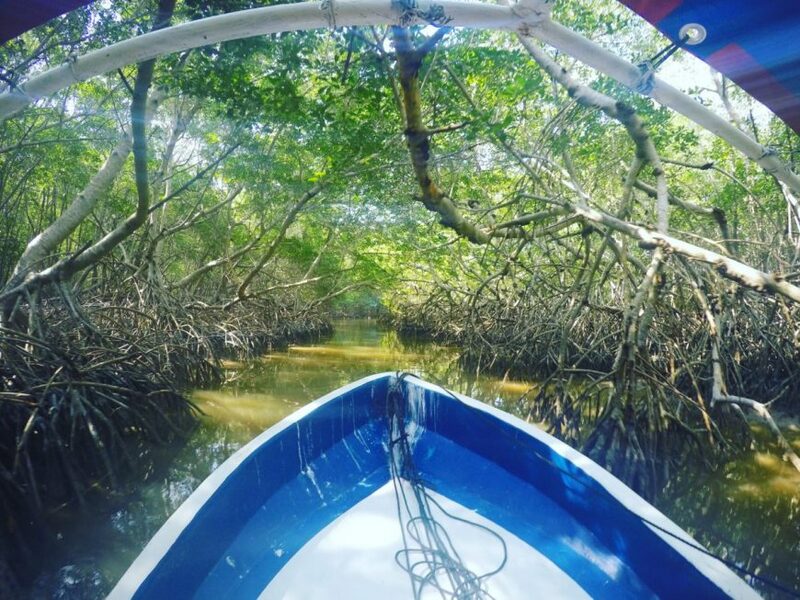 Afterwards he took us to a mangrove, where he docked up & we were able to get off & have a wander around. The trip lasted about 2.5 hours in total & was one of the highlights of our Mexico experience! After our flamingo tour we decided on an afternoon of chilling on the beach, we were very happy to discover there was not much else to do in such a sleepy seaside town. We were sat watching the sun go down when a voice behind us asked if we’d like a glass of wine? Oh why not! We were on holiday after all. 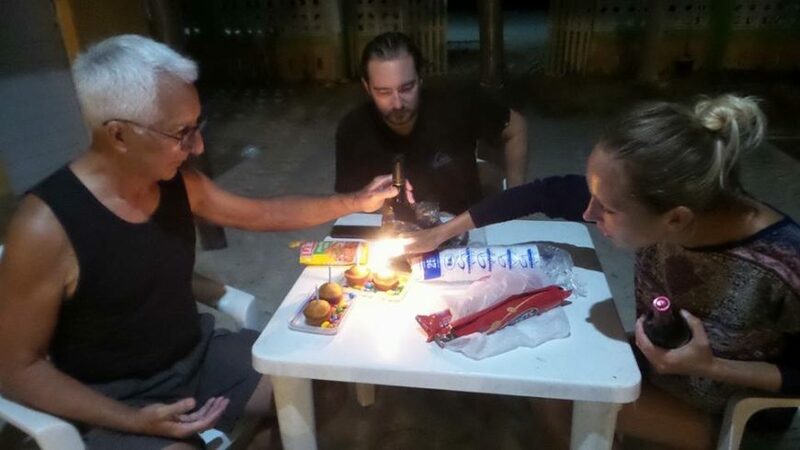 We sat talking with Scott & Penny all evening, the were from the states & had been coming down to Mexico every year for the last 30 odd years. It was amazing listening to their stories about how they used to drive down to Mexico with all of their kids in the car & how much certain places had changed since they first started coming. For me one thing about travelling is the opportunity to meet new people, unexpected people who in day-to-day life you may not have the chance meet. It’s the love of travelling & adventure that brings people together, kindred spirits, it’s really is something quite special. With our new-found love of sabultes we were hunting them down in every place that we went, we found the most delicious ones in Celestún but they really didn’t agree with Adam! He got sick, very sick & we got stuck in Celestun for a couple of days more than we had planned. It wasn’t all that bad though, we had a half decent room to stay in & Arturo our host was great in helping look after Adam, fetching extra toilet paper when needed. Scott & Penny were also there to keep us both company & to my delight practically adopted me whilst Adam was tucked up in bed. Luckily he managed to make an appearance for Scott’s birthday celebrations on our last evening, even if it meant that he couldn’t join in on eating the cake! Travellers sickness is something that is highly likely when taking such a trip, especially when travelling to such remote places. We could butter the whole thing up & only write about the good stuff but wouldn’t be our real story. Our main advice would be to carry sickness medicines & re-hydration salts & just take the time to stop & rest when poorly. Sometimes, & we for one are guilty of this, you can get so hung up on your travelling schedule that you don’t stop to think about your own well-being, which should always, always come first! By the time Adam had recovered we had really gotten used to the sleepy laid back vibe of Celestun. On our last morning we were really quite sad to say goodbye to the little fishing village, Arturo’s Place & to Scott & Penny. We had also met a lady named Cindy, who had been living in Celestun for quite some time, she wanted to take the 4 of us for breakfast before we left. We agreed & walked to the local food market with Cindy, when she started to point out murals she had painted all around town, they were literally on every third of fourth house & sure enough signed by herself with the year she had painted them. 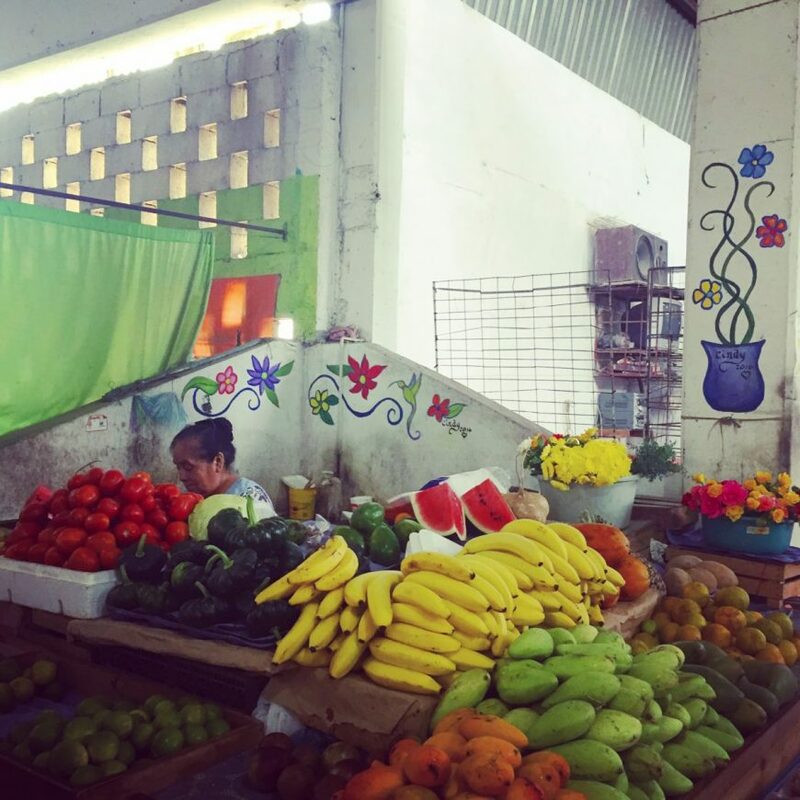 When we arrived at the market Cindy proceeded to show us more murals she had painted, the fruit stall had one, the meat stall, the taco stall, this American lady had literally painted the whole town, how funny?!! We then all sat down to a delicious local breakfast, which Adam (still scarred from the local sabultes) passed on this time round! We were entertained with the loudest Latino music being blasted from some speakers from the main square, it may have been a sleepy town but we were reminded in our last hour there that we were definitely still in Mexico! You can check out the rest of our Mexico adventures here. Campeche – Things To Do In The UNESCO City Of Pirates! San Cristobal De Las Casas – Chiapas’ Cultural Delight! This entry was posted in Mexico and tagged Celestun.